Intel Skylake: Core i5 6500 review 0 out of 5 based on 0 ratings. 0 user reviews. Whether you’re looking to purchase a Core i5 or a Core i7 for your next gaming build, the established wisdom says that you’ve got to get a K chip – the totally unlocked version of the processor you can overclock to its limits. Typically there’s a premium to pay, but when you’re getting anything up to 30 per cent in additional performance, the extra investment is more than worth it. However, with the recent release of overclocking BIOS updates for a range of motherboards, any of Intel’s recently released Skylake processors can be overclocked – which brings us to the Core i5 6500. In terms of Intel’s product line-up, it’s the one tier up from the base Core i5 6400, running at 3.2GHz compared to the 2.7GHz of the cheaper chip. It costs around £150/$200 so there’s obviously a price advantage over the top-end overclockable Core i5 6600K, but perhaps more importantly, stocks of this processor are plentiful. For reasons that aren’t 100 per cent clear, Intel’s Skylake K processors have either been hard to find, or priced considerably higher than their Haswell predecessors. The news that any Skylake CPU is now overclockable (if you have a Z170 motherboard with the required BIOS update) is obviously a game-changer, but in our initial tests, we noted something strange. Synthetic benchmarks showed that overclocking our Core i5 6500 to 4.51GHz produced faster results than a 6600K running at an almost identical 4.5GHz. However, gaming benchmarks produced more variance. On top of that, as we noted in our Core i3 6100 review, slotting in faster DDR4 memory could produce better in-game performance, most noticeable in terms of a boost to lowest recorded frame-rates. Would the same hold true for the Core i5 6500? And what would happen if we combined faster RAM with the overclock? Since the days of the second-gen Core architecture – Sandy Bridge – and the iconic Core i5 2500K, overclocking has by and large been very simple. CPU clock-speed is defined by two factors: the base clock (aka BCLK, typically 100MHz) and the multiplier, which varies between processor. The Core i5 6500 has a 32x multiplier, giving 3.2GHz (100×32=3200). The K series Intel chips allow users to increase the multiplier on the motherboard BIOS, resulting in higher CPU clock-speeds. The more you push the multiplier, the more voltage is required and the more heat generated. We don’t recommend pushing voltage any higher than 1.3v. The so-called BCLK overclock for non-K chips like the Core i5 6500 is different. The multiplier remains locked, but the base clock can be increased from the stock 100MHz. In the case of the Core i5 6500, we were comfortably stable at 1.3v with a 141MHz BCLK. Factor in the 32x multiplier and we’re at 4.51GHz. Voltage needs to be increased until the system is stable. Overclocking via BCLK means that the entire system is sped-up – and that includes RAM. In the memory settings, you’ll find that the RAM has also increased in speed, and it will need to be reduced to match the rating of the modules. Alternatively, you can try pushing RAM harder and increasing voltage there in order to achieve higher levels of memory bandwidth. No support for power-saving ‘C-State’ frequency switching, meaning a much more power-hungry, hotter machine that is always running in an overclocked state. Intel Turbo Boost is disabled. It’s not possible to read CPU temperatures, so don’t push too hard on voltage. AVX instructions – a new sub-set of x86 CPU code – may have compromised performance. Just like any overclock, different chips produce different results. Not every Core i5 6500 will hit the 4.51GHz we easily attained. Similarly, the higher you push your OC, the more power is consumed and the more heat generated – so don’t push things too hard and make sure you have a decent third party cooler. And that’s why we’re reviewing the Core i5 6500 today, several months on from its release. Overclocking redefines the product, but there’s more than one way to overclock a gaming PC – it’s not just about raw CPU clocks, faster RAM can make a difference in CPU-bound gaming scenarios, even if you don’t overclock the CPU at all. After a couple of weeks getting to know the tech, Rich reviews the Core i5 6500 in-depth. So let’s talk about our test system. We bought the Core i5 6500 ourselves from Amazon, running the system from an MSI Z170A Gaming M5 motherboard, with all tests run from a 512GB Crucial MX100 SSD. Our all-important DDR4 came in the form of two 4GB sticks of Corsair Vengeance LPX DDR4, rated for 3000MHz. Curiously, using the XMP profile for these sticks applied a mild two per cent CPU overclock, so we overrode that and increased the RAM multiplier instead, giving us 3066MHz. Overvolting the RAM to 1.35v allowed us to go further, easily hitting a stable 3200MHz. These new modules would allow us to test a whole spectrum of DDR4 frequencies and to get an idea of how faster RAM impacts gaming performance on this i5 quad. Kicking off with basic benchmarks, the stock Core i5 6500 offers few surprises, essentially offering 90 per cent of the performance of a stock-speed i5 6600K, a statistic that curiously drops to 85 per cent when running x264 video encoding. Up against the Core i7 6700K with its extra speed and hyper-threading capabilities, the Core i5 6500 lags significantly behind, even with the 4.51GHz overclock in place. But there are some curiosities here – we managed to push the 6600K to 4.5GHz before one of the four cores gave out, and here we see that the overclocked 6500 is actually faster, and that may well be down to the fact that overclocking base clock speeds up the whole chip, which doesn’t happen with the K chips, where typically only the multiplier is increased. Meanwhile, as expected, the dual-core i3 6100 drops back from the pack significantly, though the 4.4GHz overclock we achieved there throws up some interesting results – it offers around 85 per cent of the performance of the Core i5 6500, which makes us wonder how it would compare with the stock performance of the base-level i5 6400, which operates at a significantly lower clock-speed. Next, onto gaming performance where we attempt – with varying levels of success – to remove the GPU as a limiting factor by utilising an overclocked Nvidia Titan X running at 1080p resolution. In all cases, we’re running at very close to max settings: during gaming, the CPU’s job is to run the game logic and prepare instructions for the GPU. By pushing settings up, the theory is that the GPU needs to draw more, requiring more draw calls to be generated by the CPU. In effect, the higher we push quality presets, the more there should be for the GPU to render and thus a higher load on the CPU. In the initial test below, you can see how the Core i5 6500 at stock speeds and with the overclock in place performs when paired with 2666MHz RAM – where we have existing data for the K chips, and indeed the entry-level Core i3 6100, to use for the basis of comparison. What becomes clear very quickly is that even if you don’t touch the Core i5 6500’s clocks at all, it is still a highly potent performer – and that’s factoring in that we’re doing our absolute best here to push CPU performance to the forefront when in most gaming set-ups, the GPU is the major bottleneck for most modern titles. On top of that, now we can overclock the previously locked chip, giving us even more overhead. It’s a rosy picture overall bearing in mind the price differential between the i5 6500 and the other quads we’ve tested here – but we are testing with 2666MHz RAM, an option only available if you invest in a more expensive Z170 board. Those looking to save money on budget builds may opt for cheaper motherboards, where memory bandwidth is limited to 2133MHz. Gaming results from an overclocked Core i5 6500 are impressive – in some (but certainly not all) scenarios it’s challenging the Core i7 6700K. In short, there’s an argument that by using an overclocked element in the test set-up – an option not available to those using base-level components – we may well be inflating the performance of the system. Our preferred form of measuring PC performance is to use the FCAT system pioneered by Nvidia. The idea here is remarkably straightforward – rather than use internal tools such as FRAPS to measure performance, FCAT does nothing more than apply a coloured border to the output of the host PC, with each individual frames marked up, ready for analysis. The source PC is attached to an entirely separate computer, using a high-end capture card that acquires every frame produced. We’ve adapted our existing frame-rate video tools to work with the FCAT border mark-up system, allowing us – uniquely – to measure performance in context of what is actually being rendered. In short – abstract metrics like lowest frame-rate, highest frame-rate and stutter become much more meaningful when you can actually see what is causing them. We use repeatable scenes from our gaming suite to ensure as close to a like-for-like comparison as possible. Our result tables are drawn from the FCAT metrics, but on top of that, the videos allow you to see exactly how each game performs: there, not only do you see frame-rate, but frame-time too – showing persistence of every single frame generated by the system. Riva Tuner Statistics Server also has its own FCAT support – we prefer to use Nvidia’s version, but the advantage RTSS offers is the ability to gauge CPU and GPU load simultaneously – click on the shot above to see our Witcher 3 test sequence max out the Core i5 6600K. The bottom line is this – measuring CPU performance and getting meaningful metrics is challenging because the graphics card is such an important part of the system and usually the primary bottleneck. We’ve tried to address this by using an overclocked Titan X running at 1080p resolution, but it’s clear that in titles like Assassin’s Creed Unity and Shadow of Mordor it is still the major limiting factor. Elsewhere, in titles like Crysis 3, the bottleneck swaps between CPU, GPU and RAM at different points in the sequence, making final averages of limited use. By providing ‘in the moment’ comparisons, you can see for yourself differences in performance that may be caused by the CPU and memory at any given point. Where the performance metrics converge, we can assume that GPU is the bottleneck – and where they don’t, CPU and RAM take point. So we went back and re-benched the Core i5 6500 still further, keeping it at stock frequencies and running our Corsair Vengeance DDR4 at 2133MHz, 2666MHz, 3066MHz and 3200MHz – and for the 4.51GHz overclock, we also benched there at 2632MHz and 3196MHz (the closest we could get). Pay particular attention to Crysis 3, GTA 5 and The Witcher 3, where more of the benchmark sequences are CPU-bound. Processor frequency produces higher results here, not faster RAM. However, elsewhere, there are some fascinating results. We’ll zero in on one test in particular – The Witcher 3 – as a highlight. Comparing 2133MHz to 3066MHz, there’s an 18 per cent average improvement without overclocking the CPU at all, rising to 21 per cent on the all-important lowest recorded frame-rate. Comparing the stock/3066MHz DDR4 result there with the 4.51GHz/2632MHz reading in the table reveals that memory bandwidth is actually more important there than overclocking the processor. Only by pairing the overclock with 3200MHz DDR4 do we actually push that result on. Now, results may vary with different latency timings on the RAM, but the main takeaway here is clear – more memory bandwidth can make a difference. Higher memory bandwidth increases Core i5 6500 performance without the need for any CPU overclock – but combine the two and magical things can happen. And that means that the choice of motherboard cannot be overlooked. In our Core i3 6100 review, we strongly recommended a Z170 board as the basis of a Skylake-based PC. On a more budget-orientated build, there’s a perception that if you’re not overclocking, practically anything will do. But the real question is how much performance you want, and how future-proof you want your system to be. Only a Z170 board runs DDR4 modules faster than 2133MHz. Only a Z170 board can overclock your CPU. And now – until Intel releases microcode updates at least – any Skylake chip can be overclocked. There are limitations of course (check out the sidebar) and the K processors are still preferable, but once again, you’ll need a Z170 board to get the best out of them too. Now, of course, we should stress that our benchmarks are tests designed to put CPU front and centre as the bottleneck of the system. For the vast majority of your gaming, it’s the graphics card that is the major limiting factor. But this ignores a simple truth – it’s the lowest frame-rates that are most impactful to the overall gameplay experience, and either CPU or RAM can manifest as a gaming bottleneck during ‘in the moment’ action. 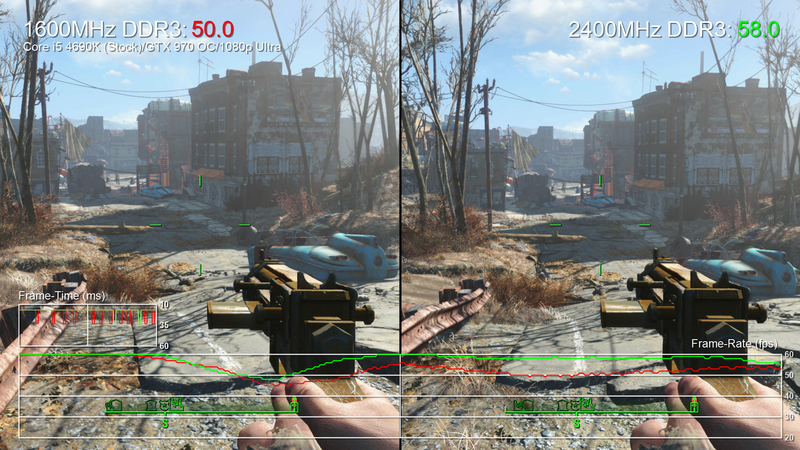 Check out this shot of Fallout 4 running on a highly capable Core i5 4690K system paired with an overclocked GTX 970. We’re using 1600MHz and 2400MHz DDR3 there and the faster stuff brings us closer to the locked 1080p60 we’re looking for. In the Witcher 3 shot below we’ve paired the i5 6500 with the same overclocked GTX 970 and you can also see a similar effect – traversing Novigrad City sends CPU utilisation to its limits, and faster RAM squeezes out more performance during ‘in the moment’ comparisons. Whether you’re using a GTX 970 or a much more capable Titan X doesn’t matter in these scenarios – CPU and memory bandwidth are the limiting factors. In the final analysis, the number one component that gets upgraded within a gaming PC is the graphics card and with that in mind, it makes sense to ensure that everything else in the system is as future-proof as it can get, within reason from a budgetary perspective. Our tests pair a Titan X with the i5 to push CPU and memory bandwidth to the forefront. But even with a more realistic pairing, faster RAM improves performance. Here we see the stock i5 6500 paired with an overclocked GTX 970 on The Witcher 3. Faster RAM improves lowest frame-rates in particular.